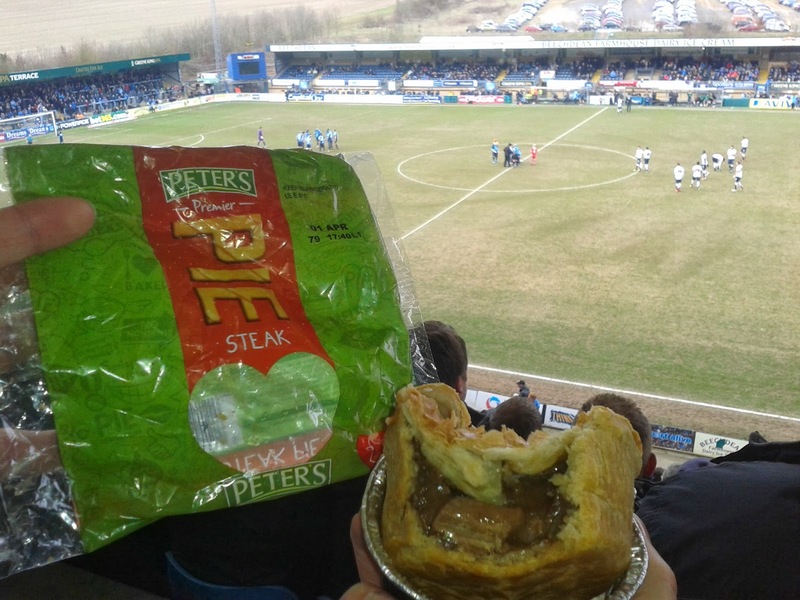 Pierate - Pie Reviews: Wandering How Good the Pies Are at Wycombe? Wandering How Good the Pies Are at Wycombe? At Pierate we well know that football and pies are a match made in heaven, just have a look at our pie football league table. However, all too often the pies can be mass produced sub-standard fare, not living up to the excitment on the pitch. That was why it was so good to see the Morecambe Football Pies score so well in our recent review. But you can get good pies even if they aren't as hand crafted as those offered by Morecambe. The quest to find these took me to Adams Park, the home of Wycombe Wanderers Football Club. In the past Wycombe pies have suffered from 'dry pie syndrome' where, despite potentially being decent pies I have found them to have sat around in a heater too long and hence dry out. This seems to have improved with myself and Pierateer ARL both picking up pies in good Condition. I opted for the Chicken Curry and ARL opted for the Steak which we have reviewed before. Both of these were from the 'Peter's Premier Pies' brand. I can tell this because they are much taller than the shallow 'oval' pies in the standard range (we have also reviewed these). 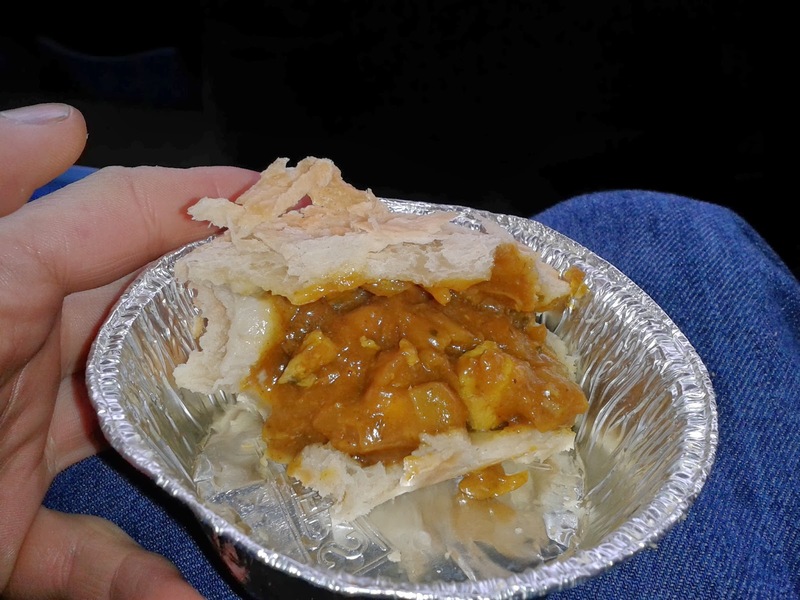 For some reason the chicken curry pie came in a very plain packaging and didn't say 'premier' on it. 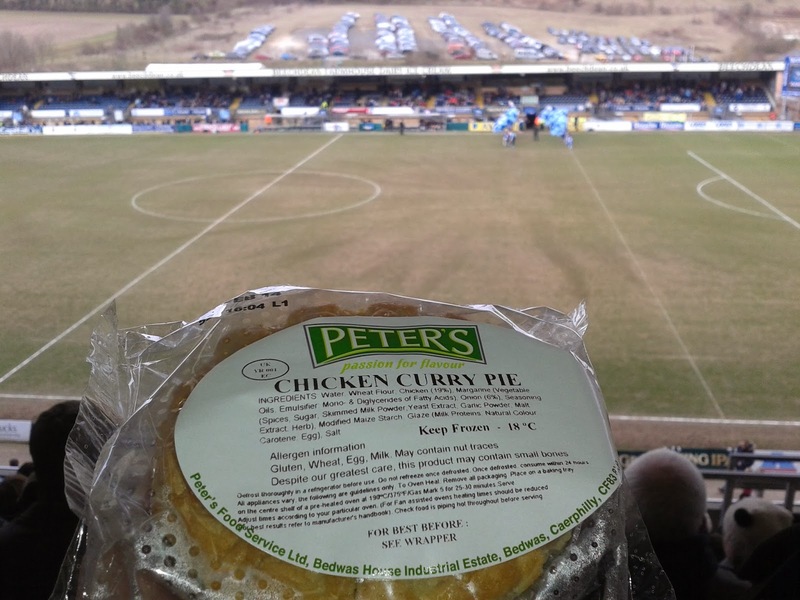 However, according to their website, Peter's don't do a standard chicken curry pie so it must be 'premier'. The choice of the premier range by Wycombe is a good one. The two offerings from the Welsh company that we have reviewed before both scored very well (Steak 5.75 and Steak & Fullers 5.20). At Wycombe they are retailing at £2.70 for just the pie. This may seem high compared to other hot pies, but of course football grounds tend to be more expensive so we take this into account. If you look at the BBC price of football raw data this is about average for League 2. The pie looked quite good, standing tall which gave a good Capacity. The Colour looked a bit pale in places which hinted at soft pastry, which was indeed the case. I would like to see more of a golden colour. The pie passed the 'hand held' test which is vital for the perfect football pie. The pastry held together and the filling was thick. The Content was vibrant, not overly spicy but just enough to give it some flavour. It didn't do anything particularly special given that it was similar to standard chip shop curry sauce. The small amount of onion was a welcome addition. The chicken did retain some bite although it was suspiciously homogenous and of course tasted a bit mass produced. However, I still really enjoyed this as a change from steak pies which have been really in form for me. The pastry was a little too soft in my opinion, it was nice that it slipped down so easily but there wasn't much to get your teeth into. It also felt a bit stodgy. Overall, this line up of Wycombe and Peter's is a good partnership. They have a bit of creativity going for the chicken curry pie option which hit the back of the net. It was vital that the pie was good because it was an otherwise disappointing game and result for Wycombe, losing in the last minute of injury time 1-0 at home to Accrington Stanley. What Makes The Best Scotch Pie? I Wish It Could Be Christmas Everyday! British Pie Awards 2014 – We’ll see you there! Do they bake pie well at Thurlwell’s? Morecambe FC - We Ate All The Pies! Do Maxi Brand pies give maximum flavour? How luxurious are Harrods mini mince pies? Do I go all mushy on a beef and mushy pea pie?